Achille Lucien Mauzan (Born 1883) was born on the French Riviera, but in 1905 he moved to Italy. Mauzan was known as a decorative illustrator, though he also painted and sculpted. He was also an illustrator of posters and postcards. He was designing during the Art Deco movement. He studied in the École des Beaux-Arts at Lyon, France, after which he divided his life between Buenos Aires, Paris and Milan. From 1920 to 1940 - the period between the wars - Mauzan used materials and forms under the influence of the avant-garde cubists. During Mauzan’s career as a poster designer and printer, he designed more than two thousand posters. He used a style that was marked by brilliant colors and humor for events and advertisement and more than one thousand postcard images. Mauzan is also noted for the several war posters that he designed including an adaptation of the famous poster of Lord Kitchener. 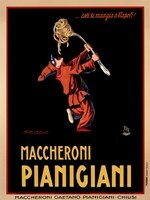 Mauzan made numerous vital posters in Turin for the Italian film industry. From 1912 to 1917, he worked at Ricordi music publishing. And from 1919 to 1923, he worked in the Magical press. In 1924, Mauzan and Morzenti established a publishing house which they named Mauzan-Morzenti Agency. Mauzan travelled to Argentina in 1926 and established a publishing house called Mauzan Posters (Affiches Mauzan), where many of his greatest works were created and where he worked until 1932. It was within those years that one of his students in Milan called Gino Boccasile travelled to Argentina at his insistence and set up a studio. In 1933, the artist returned to France, where he continued with his work for the rest of his life.